Cat fans might be surprised to learn that The Phillips Collection is a notoriously feline-friendly museum. 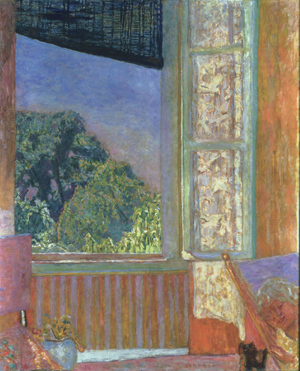 The Phillips Collection has a number of cats represented in its paintings—like Pierre Bonnard’s The Open Window (1921)—but the museum also housed real cats at one point. In the ’70s, two cats roamed the halls of the museum. Fiona, an Oriental Shorthair, was gifted to the Phillips by Curator Walter Hopps of the National Collection of Fine Arts (now the Smithsonian American Art Museum). Bazooka, a black and white tabby, was given to the Phillips by Fondo del Sol Visual Arts Center. Though their beds and food were located in a small (now non-existent) room near the library, they were known to wander around the offices of the museum. They visited desks for attention, found pools of sunlight to nap and bask in, and every day at around lunch time, they would run to the registrar’s desk where they knew they could get treats. After eating a few nibbles of ham, Bazooka was known to “sun” under the lamp on the registrar’s desk and drape himself over the phone. Sometimes when someone called in the afternoon, the caller would hear a disgruntled meow as the registrar picked up the phone and disturbed Bazooka’s slumber. Bazooka and Fiona largely avoided the crowds in the museum, though they did meet a few visitors. During a school tour, a feline-phobic student took one look at Fiona and went running down the stairs screaming at the top of her lungs, Preparator Bill Koberg recalls. That was the pinnacle of excitement for these kitties, as they lead their lives in peaceful and quiet leisure behind the scenes at the Phillips. Do you remember Fiona and Bazooka from a previous visit? Do you have a favorite painting with a cat (or another furry friend) in it? Let us know in the comments!